At Some Point Its Payback Time! As much as we would all like to be “Consistently Profitable” in trading – every week, every day, heck every trade… reality dictates otherwise. Understanding the concept of drawdown weeks is vital to your longevity as a successful Emini Day Trader. Just as the market itself goes through up and down cycles with price, volume, range, volatility, etc, so too your levels of trading profitability will go through up and down cycles. After a string of 3-4 high point scoring weeks in trading, you may notice that your system or strategy may hit 1-2 weeks of tough going and fail to deliver the gains you have become accustomed to. I call these “Drawdown weeks” because after a period of consistent profitability it’s suddenly payback time! 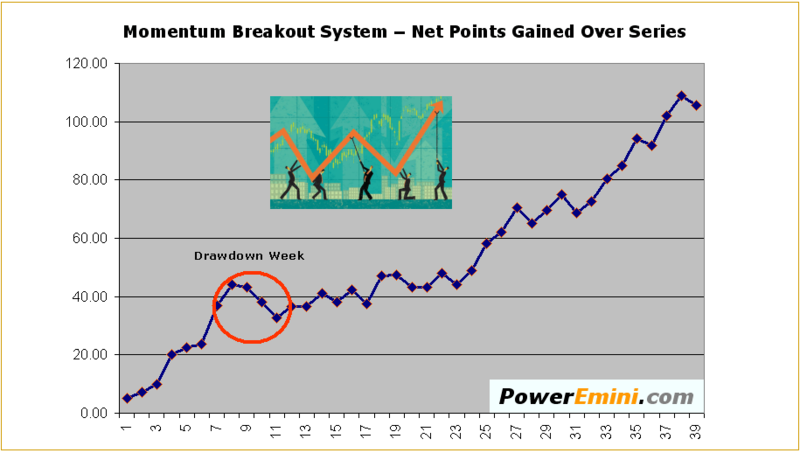 You will notice how the graph below looks just like your typical stock chart in an up trend, with higher highs and higher lows.. and yet it is NOT a stock price chart, but a graph depicting the net point gains in Emini Day Trading per day. On the left you will see the drawdown week where you gave some back. Looks like the typical price pullback. What Causes A Drawdown Week? Lets assume we are working with a trading methodology that has proven itself week after week. What causes one of these drawdown periods to eventually show up on the radar? Although YOU could be personally responsible for the drawdown week due to sloppy/emotional trading, most drawdown weeks occur during, and are caused by – lousy market conditions. Yes.. there is a direct one-to-one correlation. The market could be extremely DULL or too VOLATILE that week making it extra difficult to navigate the trading landscape and come out ahead. We all know that when the market gets stuck in the doldrums, we see price action slow down, volume drops off, overall market movement gets choppy and to top it off strong trending action becomes a rarity making it impossible to catch runners. Many times the market will have just enough momentum to trigger us into trades, but not enough momentum for any decent follow-through, leading to a much higher failure rate with more stops getting hit. The bottom line is that the market conditions are just not conducive to making money no matter who you are. The first and most important thing to accept is that drawdown weeks are a normal part of doing business as a trader and they do not necessarily mean your system is broken or that your strategy doesn’t work. Most drawdown weeks are the direct result of poor market conditions. Drawdown weeks WILL OCCUR so you better know how to recognize them and deal with them when they do. If for instance, the market has been stuck in a tight range on the daily timeframe, and you are 2-3 days into the trading week without any substantial point gains, you are probably experiencing a payback week. If you push too hard you will only make it worse. The best response to a drawdown week is to back off and let it pass by. You can reduce your position sizes, lower your targets, trade less the main thing is don’t be overly aggressive. You don’t want to allow your drawdown week to turn into a catastrophic loss in your account. Realize that eventually the market will run hot again and good trading action will come back with a vengeance. Your goal is to still be around when it does. Read More About Drawdown In Trading at Investopedia.